In India, the idea of involving students in the task of national service dates back to the times of Mahatma Gandhi, the father of the nation. The central theme which he tried to impress upon his student audience time and again, was that they should always keep before them, their social responsibility. The first duty of the students should be, not to treat their period of study as one of the opportunities for indulgence in intellectual luxury, but for preparing themselves for final dedication in the service of those who provided the sinews of the nation with the national goods & services so essential to society. 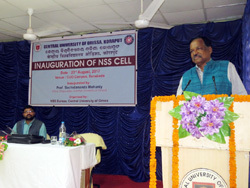 Advising them to form a living contact with the community in whose midst their institution is located, he suggested that instead of undertaking academic research about economic and social disability, the students should do "something positive so that the life of the villagers might be raised to a higher material and moral level". 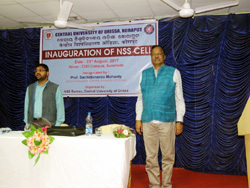 Keeping this vision of Mahatma Gandhi in mind, the Central University of Orissa under the visionary leadership of Prof. Sachidananda Mohanty, Vice Chancellor - CUO initiated the process of setting up a NSS Bureau vide. Letter no. VCO/CUO/2016/24 dated 20/10/2016 and subsequently, the Government of Odisha vide. Letter No. X-HE-NSS-PLAN-0026/2016/1154/14 dated 02/05/2017 and Letter No-XHE-NSS-47/2017/3703(2)/HE dated 29/05/2017 allocated 1000 NSS volunteers in favor of Central University of Orissa. 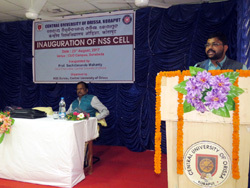 The NSS Cell at Central University of Orissa was formally inaugurated by the Vice Chancellor, Prof. Sachidananda Mohanty on 23rd August, 2017. The response of the students regarding National Service Scheme (NSS) has been overwhelming and in the first year of its inception, 277 students enrolled themselves as NSS Volunteers. 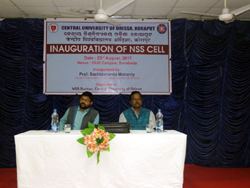 The Central University of Orissa has adopted five villages in its vicinity at Sunabeda and aims to bring about a positive transformation by interacting with the community at the grassroots level and bridging the divide between the haves and have-nots. Sh. 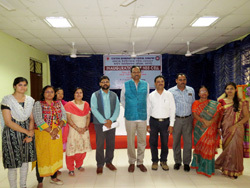 Sujit Kumar Mohanty, faculty in the department of Journalism and Mass Communication has been appointed as the Programme Coordinator of National Service Scheme (NSS) Bureau at Central University of Orissa. A working committee under the supervision of Programme Coordinator - NSS has also been constituted to carry out various activities of social reconstruction and nation building. Programme Officers for the academic session 2017-18 from within the working committee are also working in close association with the NSS volunteers.